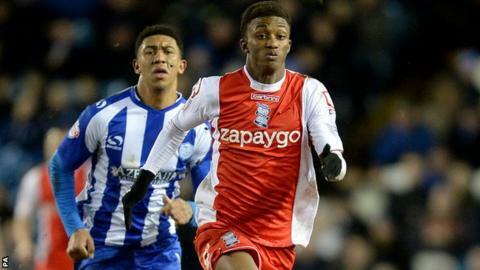 Birmingham City have rejected a fourth bid for teenage winger Demarai Gray from Championship rivals Bournemouth. The latest £3.5m offer, which could have risen to £4m with add-ons, was again dismissed by Blues. The club remain insistent that the 18-year-old Birmingham-born Academy product is not for sale. Gray, left on the bench for the FA Cup fourth round tie with West Brom on Saturday, was recalled for Tuesday's goalless draw at Sheffield Wednesday. The exciting youngster, who made his debut as a 17-year-old last season, has become a regular under new boss Gary Rowett in the last two months, scoring four goals and creating numerous chances. Gray's athleticism and pace on the wing led to him receiving the Football League Young Player Of The Month award for December last week. He became the third-youngest player in the club's 130-year history to score a hat-trick in the 6-1 home win over Reading, part of a run of just two defeats in 14 matches that has propelled Blues from 23rd to 11th in the Championship table - 15 points behind leaders Bournemouth. Meanwhile, the club's parent company, Birmingham International Holdings Limited, has appointed former owner Carson Yeung's brother-in-law, Ma Shui Cheong, 53, as its new chief executive and managing director.